The closing months of 1776 had been dire for George Washington and the Continental Army. Most recently, the losses of forts Washington and Lee had been followed by a hasty retreat across New Jersey with the army of Lord Cornwallis in close pursuit. In early December, the Americans found temporary safety by crossing the Delaware River into Pennsylvania; those boats not used in the evacuation were destroyed, making it impossible for the British to follow until ice formed. Washington’s army had lost more than half of its men to illness, desertion and enlistment expirations. Faltering morale received a badly needed boost from Thomas Paine, who was serving as a volunteer aide; the stirring words of his pamphlet The Crisis were read to the soldiers on Washington's orders. As Christmas approached, a Loyalist butcher named John Honeyman was captured by American scouts in New Jersey and taken to Pennsylvania for an interview with Washington. In actuality, he was an American spy who conveyed the news to his comrades that Sir William Howe, the British commander, had called off Cornwallis’s pursuit and that their armies would take up winter quarters on Manhattan Island and Staten Island; several positions in New Jersey were to be manned by Hessian mercenaries. Honeyman was returned to Trenton, where he informed Colonel Johann Gottlieb Rall that the Americans were completely demoralized and incapable of mounting an attack. the fear of his army's continuing evaporation by large-scale enlistment expirations scheduled for the end of the year. On the evening of December 25, the American forces began to cross the Delaware in what was intended to be a three-pronged offensive. Weather conditions, however, did not make the passage easy. The heavily laden boats had to avoid ice floes in the river and a heavy snow storm turned to sleet. 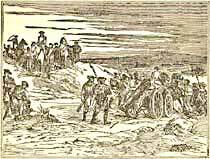 One segment of the offensive never departed from Pennsylvania and another succeeded in transporting its soldiers across the river, but not its artillery; those men returned to camp and did not participate in the battle. Washington had hoped to strike under the cover of darkness, but the difficulties encountered in the crossing delayed the attack until about 8 a.m. on the 26th. The American advance had been spotted earlier by a Tory, who delivered a written warning to Rall. The colonel, however, was intent on celebrating Christmas and had stuffed the note in his pocket. Continental forces under Nathanael Greene and John Sullivan opened fire on the town and slowly surrounded it. A sleepy Rall mounted his horse and tried to rally his soldiers, but was shot and died later from his wounds. Within 90 minutes it was evident to the Hessians that they were outnumbered and escape routes had been cut off; they surrendered. For the first time, Washington’s forces had defeated a regular army in the field. American losses were extremely light; only two soldiers died and those apparently from exposure, not enemy fire. The Hessians sustained more than 100 casualties and 900 of their soldiers were captured. Several hundred Hessians escaped and presumably became American farmers and tradesmen. Further, Washington gained six cannon, 40 horses and a vast array of supplies that were quickly transported to Pennsylvania. Washington's command was solidified. A growing number of delegates to Congress had come to doubt his abilities, but those critics were quieted when news of the victory arrived in Baltimore. The victory sharply increased morale. New enlistments were stimulated and many of the current soldiers reenlisted. This turn of events enabled Washington to execute another daring move — the attack on Princeton on January 3. Brief thought was given to pursuing the fleeing Hessians, but continuing bad weather and the fact that American soldiers had discovered casks of rum ruled out that option. See also campaigns of 1776 and timeline of the War of Independence . The Last Founding Father: James Monroe and a Nation's Call to Greatness by Harlow Giles Unger. The Winter Soldiers: The Battles for Trenton and Princeton by Richard M. Ketchum.